Since the Royal Commission kicked off hardly a day has gone by without Australia’s largest financial institutions in the news, for all the wrong reasons. Some of the accusations are quite shocking and make for great headlines. The impact has been immediate with all of the majors accelerating their move to offload or restructure their advice businesses. CBA wants to get rid of advice. NAB will sell MLC Wealth. And most recently Macquarie’s restructuring of the MPW business is now underway. There will be a flurry of corporate activity, old business models will die and a new model for financial advice (fee-for-service, non-product aligned) will likely emerge as the winner. While most of the media attention has thus far focused on those who will be negatively impacted, there will also be fantastic opportunities for those ready to take advantage of them. And that is the focus for this wire. 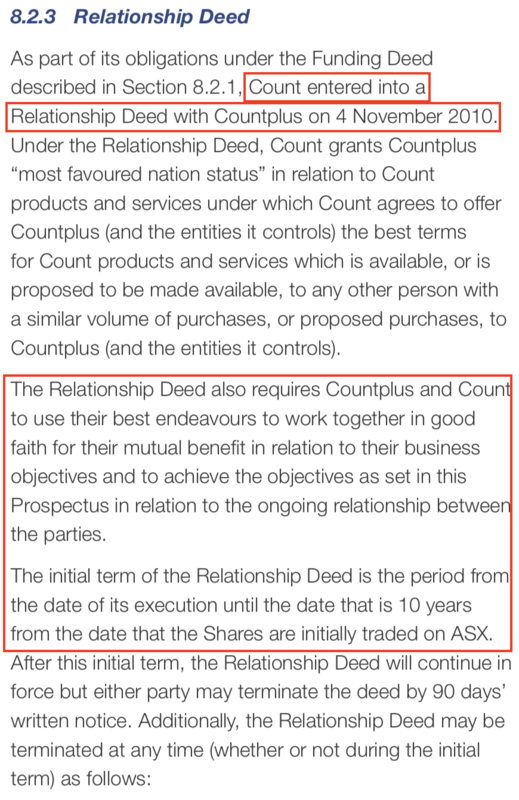 In the small cap space there is one company - CountPlus (ASX:CUP) - that is uniquely positioned to benefit. The Royal Commission may act as a catalyst for realising the underlying value in CUP and one of the ways it may do so is for CUP to become a takeover target. On top of that the stock is trading at half the earnings multiple of its peers, generates strong free cash flows, has ~$50m of capacity for acquisitions and is an emerging growth story. It also happens to be perfectly positioned for the new education standards, already operates a fee-for-service model and bears no risk in the (however unlikely) event that product and advice is separated. The directors recently acquired ~$1 million worth of stock on-market. That alone makes it worth a look. This one is quite an interesting thesis. So grab a cup of coffee. I’ll start by explaining why the Royal Commission is a catalyst and then lay out the investment thesis for CUP. CUP was listed in 2010 as a spin-off from the larger Count Financial (which I will refer to herein as ‘Count’). Count still owns 36% of CUP. Count’s business model involves licensing accountants under Count’s AFSL so that they are able to provide financial advice to their clients. They pay a fee to Count for that benefit. 300 accounting firms sit under the Count license for a total of around 500 advisers. 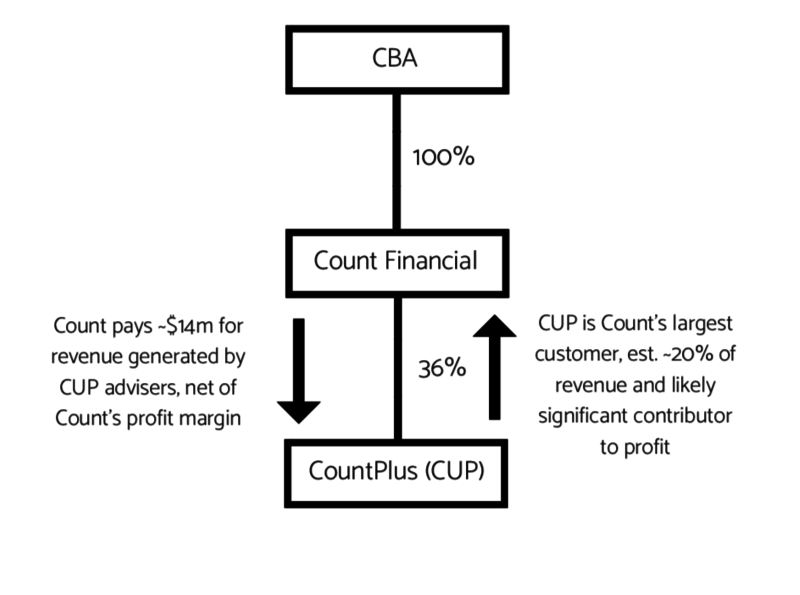 CUP, which used to be owned by Count, is a network of 15 accounting firms and a dealer group (TFSA). All of CUP’s accounting firms also provide financial advice. In order to do so, 13 of these accounting firms sit under Count’s license. That makes CUP the largest customer of Count, in the order of 20% of Count’s revenue and around 30% of Funds Under Advice (FUA), if not more given the declining adviser numbers at Count. One of the key points was that CUP would remain a customer of Count for the length of the agreement as it was critical for Count that the CUP firms wouldn’t leave. In return Count were going to assist CUP in acquiring network firms (the latter doesn’t appear to have eventuated as planned). The agreement ends in November 2020 at which point CUP would be free to move their firms elsewhere. There is nothing that Count provides CUP that CUP cannot get from another provider. This was explicitly stated in the 2010 prospectus from the perspective of controlling risks. It just so happens that CUP’s own dealer group - TFSA - provides CUP with the capability to internalise those firms and retain the costs currently paid away to Count. The CUP annual reports state that Count pays CUP a net amount of approximately $14m annually. This is the revenue generated by the CUP advisers sitting under Count’s license with Count taking a clip on the way through, likely in the vicinity of $2-$4m a year assuming standard industry margins. That estimated $2-$4m is the expense that CUP can internalise from 2020 if they decided to bring their firms under TFSA, resulting in a commensurate boost to earnings that isn’t being factored into the share price. The increase would be equivalent to a +20-40% rise in current run-rate EBITA, all else equal. That is the first part to the thesis. In 2011, a year after CUP was listed CBA came along and paid $370m for Count. The big risk with the acquisition was that advisers would leave. And they did. Competitors like BT offered the Count advisers better deals to lure them elsewhere. To negate this CBA started paying CUP (as the largest franchise group under Count) multi-million dollar annual loyalty payments. The final payment of $4m occurred in FY14. Fast forward to the Royal Commission and the public is now well aware of the misdeeds of the bank-owned advice businesses such as Count, amongst which was the charging of fees to people who had passed away years prior. In addition to the terrible perception this has created, the business model under which the banks ran these businesses is under increasing regulatory scrutiny. The result for Count has been a decline from a profit of $25m in 2011 to barely profitable according to the latest publicly available set of accounts. It is now well known that CBA wants to sell Count. The latest rumours from CBA sources state that a sale is likely to get underway in the second half of this year. It is clear that Count has been in preparation for sale for a while now. It appears the Royal Commission has accelerated CBA’s desire to offload the business. Remember that CBA were not necessarily running Count as a highly profitable business in its own right but rather as a means of distribution into the much larger product and platforms businesses. Under the right management it can indeed be a profitable business once again, so there will be bidders. The question, and potentially the reason why a sale is yet to eventuate, is who is going to buy (or pay anywhere near $370m for) a marginally profitable business if the largest customer (CUP) can get up and leave in just two years time, taking a large chunk of profit with it? The answer is likely nobody. Unless of course CBA (or the acquirer) can retain CUP as the largest customer. 1. Loyalty Payments: If CBA are looking to sell Count in the near term they may well seek to extend the ten year agreement with CUP to ensure their biggest customer does not leave. Doing so would improve CBA’s ability to sell Count for a favourable price. This may lead to some form of annual loyalty payment being reinstated. These payments would need to be material to the bottom line to justify the agreement from CUP’s perspective. 2. Count Acquired, Then CUP: If an acquirer buys Count later this year it would be make a lot of sense for them to mop up the rest (64%) of CUP given the importance of CUP to Count and the current attractive pricing. Further, CBA would be wise to line up a buyer for both businesses simultaneously and agree to vote their CUP shareholding in favour of a takeover. Doing so would maximise the value CBA can extract from both businesses given the Count buyer would retain CUP (so can justify paying more) and they could offload their CUP stake at fair value in the takeover, the price of which would be significantly higher than the current share price. Alternatively, a bidder might take over Count and then start paying some form of loyalty payments to retain the largest customer, the same way CBA did when they bought Count. 3. CUP Acquired, Then Count: An idea for any private equity firms reading this. If a bidder was bold enough to buy CUP it would secure the leverage that CUP currently has over CBA through controlling its largest customer. They could then go to CBA as the only logical buyer and the one that can justify paying a higher price than any other bidder, and acquire Count for a bargain. It would be a bold move but it is possible, particularly if the bidder saw the merit in acquiring CUP in its own right (i.e regardless of the success of a subsequent Count bid). And if well executed it would be highly lucrative. 4. Nothing Happens, Profits Rise: Assuming no corporate activity from 2020 CUP can internalise their firms and retain something in the order of $2-$4m of costs currently being paid away. At some point this needs to be reflected in the share price. CBA would be fully aware how reliant the Count business is on CUP. And that reliance is increasing, not decreasing, as Count’s total adviser numbers have been declining, making CUP’s advisers a larger portion of the total. Despite increasing attention in the financial media on the upcoming sale of Count there has yet to be any discussion around its reliance on CUP or on the list of potential buyers. CUP has zero broker coverage meaning this fairly simple story is yet to be told to the broader market. Hence the current share price is not yet factoring it in. That creates the opportunity. As the Count sale approaches attention will inevitably turn to CUP from funds, brokers and the financial media. From here the question becomes: what is CUP worth and what would an acquirer have to pay if they wanted to take control? For those diligent Livewire readers who are still paying attention here is what I view as the best part. For most of its listed life CUP was a poor performer, the victim of a misaligned incentive system where CUP acquired 100% of accounting firms and left the principals with little motivation to run their firms optimally. Throw in subpar compliance and a rogue adviser at TFSA and the result was a business performing well below its capacity. That saw a new board and management team brought in, led by CEO Matthew Rowe, in early 2017. At that point in time the top line of the accounting firms was growing modestly and cash flow was still good but firm level EBITA margins were lagging at just 12% vs best practice of 25%. ASIC had imposed conditions on TFSA as a result of the rogue adviser, resulting in an inability to profitably grow that business while increased compliance and restructuring costs resulted in its earnings contribution declining considerably. And when the new board cut the unsustainably high dividend the stock plummeted as yield chasers exited en masse. But since then the turnaround has progressed well, driven primarily by a new incentive structure brought in by the CEO whereby principals will now retain ownership in their individual firms. Existing firm principals will have the right to buy back equity in their firms subject to hitting certain performance criteria including EBITA margins, lock up (WIP + Debtors) and implementing KPIs, business plans and CUP appointed Independent Chairmen at each firm, as well as agreeing to new shareholder & employment agreements. In 1H18 CUP managed to increase underlying PBT by ~20%. In order to highlight the value in CUP at current prices we need to make a number of adjustments to the income statement. This includes removing impairments, gains on sale, amortisation of acquired relationships and the contribution from non-controlling interests (NCI). The next step is to work out the current run-rate earnings. With any turnaround story it is easy to focus too much on the past. But what matters is what sort of earnings capacity the business has now and into the future. For this we normalise earnings (as above) and adjust for the fact that the balance sheet is now in a net cash position with interest expense moving towards zero for 2H. Interest expense will increase again as debt is deployed for acquisitions. The table below provides an estimate of run-rate earnings. The above highlights the underlying earnings power of the existing CUP firms, currently being masked by messy accounts. In time these accounts will look a whole lot cleaner and the market will price the stock appropriately. The company has also managed to move quickly to a net cash position due to the sale of its Class (ASX:CL1) shares, divesting underperforming firms and continued strong cash flows. The stock is on 10x current run-rate NPATA which is compelling for a business growing earnings at c.20% particularly when you consider how much capacity there is for further margin improvement. It is when you look at the earnings drivers over the next couple of years that the stock really starts to look cheap. 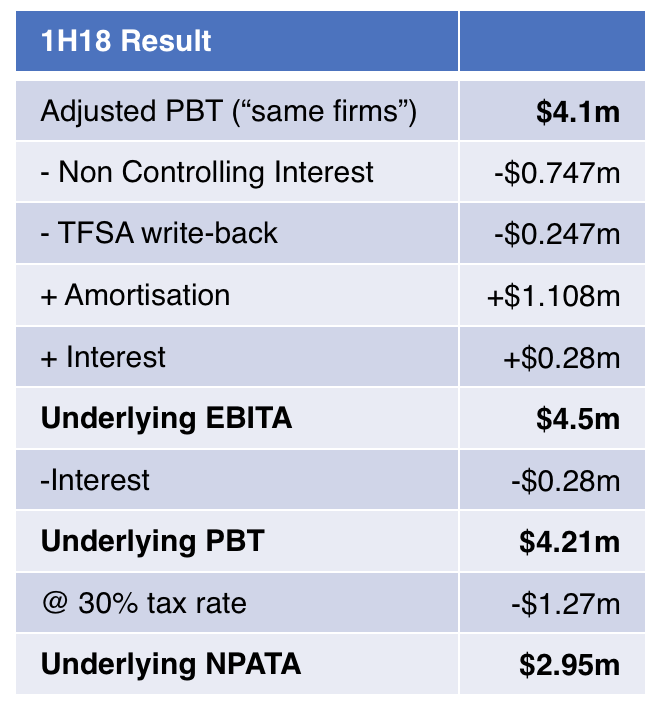 The strong growth in PBT for 1H18 was purely driven by the margin uplift at CUP’s accounting firms. Firm level EBITA margins rose from ~12% to ~17% for the half. On $60m of accounting revenue this margin uplift is material to the bottom line. And there appears to be more to come. Management are targeting 25% EBITA margins within the next 12-24 months. All else equal and before factoring in revenue growth that would be an additional ~$5m of EBITA to the bottom line from existing firms. That growth will be partially offset by the gradual sale of equity back to principals with the cash injected then able to be redeployed for acquisitions. Given that principals must first achieve certain targets, one of which is the uplift in earnings and margins, the associated reduction will be gradual and more than offset by organic and acquired earnings growth. The strength of the accounting firms in 1H was offset by TFSA which actually went backwards, meaning the accounting firms outperformed the reported figure. TFSA used to be the most profitable business in the group but it is likely that it was break even or thereabouts in 1H18. But in April of this year ASIC removed the license conditions imposed on TFSA post the issues with the rogue adviser. That means CUP are now able to focus on growing the adviser count under the new operating model which was rolled out last month. With a completely new management team and significantly improved governance and compliance systems, TFSA will eventually become a material contributor to the group once again. It won’t be a quick process but it will be earnings accretive. Given the issues experienced by the bank-owned advice businesses and the difficulty for smaller dealer groups to keep up with the ever increasing compliance requirements, TFSA is well placed as a mid-tier ASX listed company-backed dealer group at a time where independence is increasingly important. Beyond earnings another important metric to watch for the accounting firms is lock-up, the combination of debtors and WIP. The figure has moved from 107 days 12 months ago to 97 days at 1H18 and is on track for management’s target of 85 days by 30 June 2018. Reducing lock up is important because it frees up capital that can be redeployed for growth or returned to shareholders. The decrease from 107 days to 97 days equated to a reduction of $6m ‘locked up’ with more to come. The CEO has been clear from day one that CUP is a 2 year turnaround story. The big positive is that it appears much of the turnaround work in the existing firms is nearing completion and the company can now focus on growth. CUP looks compelling value based on the turnaround underway at the existing firms and the earnings accretion that exists in the potential for margin uplift. But the real upside is in acquisitions. If they are going to achieve that vision they are going to need to make a lot of acquisitions. And with a new $25m debt facility, strong free cash flow generation, a net cash balance sheet and proceeds from the sale of equity to partners, CUP now has well over $50m of acquisition capacity to deploy over the next 2-3 years. If you simply assume typical transaction multiples for the accounting and advice industries that equates to an additional $10m+ of EBITA. And the team they are building in order to so is impressive. The CEO used to be the Chair of the Financial Planning Association. The Chairman is a well connected adviser to the private equity industry. The NED is the founder of private equity firm Crescent Capital. The recently appointed M&A advisers - Genesis Advisory - are all ex Crescent Capital team members. This is a team with the capability (and probably the desire) to build something big. It is unlikely to be a run of the mill accounting roll up. CUP are looking to acquire converged firms, meaning firms that provide both accounting and financial advice. There is also the opportunity to acquire, for example, an accounting business and merge it with an existing CUP firm that also provides advice. The recent acquisition of Walker & Andrews in May was a good example of this. As CUP deploys (primarily debt funded) capital to acquire stakes in new businesses it will also have cash coming back in the door from the sale of equity to principals of existing firms, at least over the next 2 years until the latter process is complete. As a result forward earnings estimates will depend greatly on the pace of acquisitions vs the rate of equity sales. For example, if the company simply matches the pace of acquisitions with the rate of equity sales then earnings growth will be driven by organic growth alone and the company will retain a strong and growing net cash position. This would result in excess cash building up on the balance sheet. But if the company wants to gear (i.e moderate net debt position) and acquire more aggressively then the earnings that will result will be substantially higher. Management have indicated in discussions that they intend to gear the balance sheet in order to boost earnings and ROE, so the latter scenario appears more likely assuming successful execution. With that said it never hurts to take a more conservative approach. The table below assumes that the sale of equity is actually faster than rate of acquisitions over the next couple of years. This allows us to work off conservative assumptions while still highlighting the underlying value of CUP at current prices. There is enormous upside in CUP’s acquisition strategy if they get it right. Even on fairly conservative assumptions like those made in the table above there is no reason why CUP can’t be generating ~$20m of EBITA in 2-3 years time without any dilution to shareholders given the ability to fund these deals with debt and cash flows. Generally speaking, there is only one reason why directors buy shares aggressively on-market. Below are the recent director share purchases for CUP. As a side note for those investors who enjoy straight-talking, aligned communications from their CEO, have a read of CUP’s Shareholder Letters. 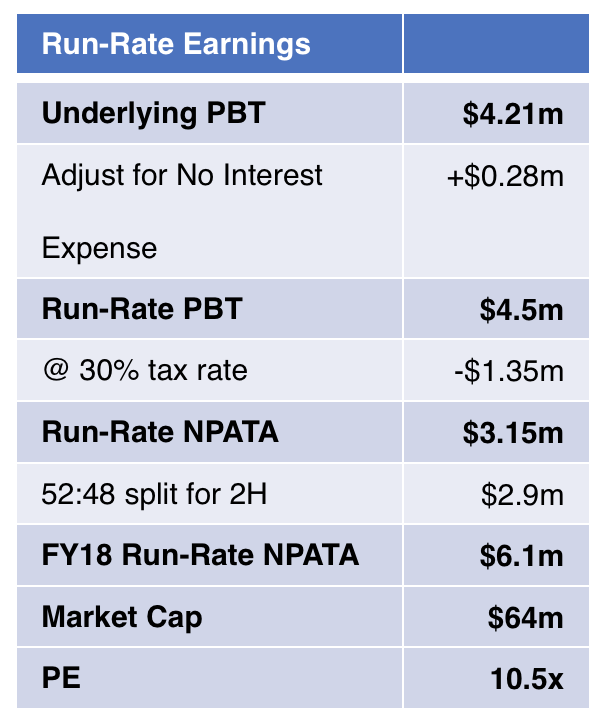 They rival ASX:KPT and ASX:ONT as the best I have come across. With enormous change occurring in the advice industry CUP finds itself uniquely positioned. The new education standards require advisers to be tertiary educated. This will result in a significant reduction in the total number of advisers with some surveys suggesting up to a 75% decline, at a time when the consumers need for quality advice is increasing. For many advice groups this will be an enormous challenge. But for CUP given all of its advisers are accountants the company should have no issue meeting the incoming standards. The Royal Commission highlighted some of the problems with vertical integration. It also brought up the possibility of separating product and advice, something that would impact far more than just the big banks and AMP. But CUP is already focused on building a non-product aligned, fee-for-service advice business with accounting at its core. ASIC have been very clear that commissions are on their way out and fee-for-service is the model for tomorrow. While many groups are at risk of these changes, CUP stands to benefit. Accounting and advice are high quality businesses with annuity revenue streams, low capital requirements, high returns on capital, significant regulatory barriers to entry and relatively stable cash flows. The key with people-based businesses like these are ensuring incentives are properly aligned for all stakeholders. The new management team’s ‘Owner-Driver, Partner’ model is an effort to do exactly that. With a turnaround there are often bumps along the way. The progress made by the new management team thus far has been impressive but the possibility of further hiccups remains present. I would argue that the current valuation somewhat compensates you for this risk, but investors should remain aware. Another question is, how will the market react to CUP’s new operating model? There are precedents where it has worked well. Steadfast (ASX:SDF), which has a similar structure to CUP’s new model, trades on a PE multiple in the mid 20’s. The incentive structure makes perfect sense and in theory is highly scalable. That should warrant a lofty earnings multiple once the company has a demonstrated track record, but this remains to be seen. Beyond that are all the business as usual risks like competition, technology, regulation and people. All of these need to be factored into the equation. The table below is based on the earnings estimates provided above out to FY21. We can then compare this to a handful of listed peers and comparable M&A transactions to get an idea of what CUP is worth. Lets start by being conservative. Assume the market starts to figure out that CUP is well positioned for the current changes occurring in the industry, but doesn’t fully buy into the new growth strategy. In such a situation a PE multiple of 12-13x is probably reasonable. Well below other peers and the market multiple, but with a decent margin of safety factored in. This would see CUP trade at 80-85c and is my base case valuation for where the stock should be trading today, with upside as they make acquisitions. Another way to look at it is to compare CUP to peers. KPG is probably the closest comparable listed peer at the moment. CUP now has a more scalable model than KPG, a more substantial advice offering (which typically trades on higher multiples) and more capacity for both organic growth (through margin normalisation) and acquisitions. And KPG doesn’t appear to be over priced, it is likely trading around fair value. It would be quite reasonable to expect CUP’s earnings multiple to move towards that of KPG in the near term. That would see the stock trading at 90c-$1.05. 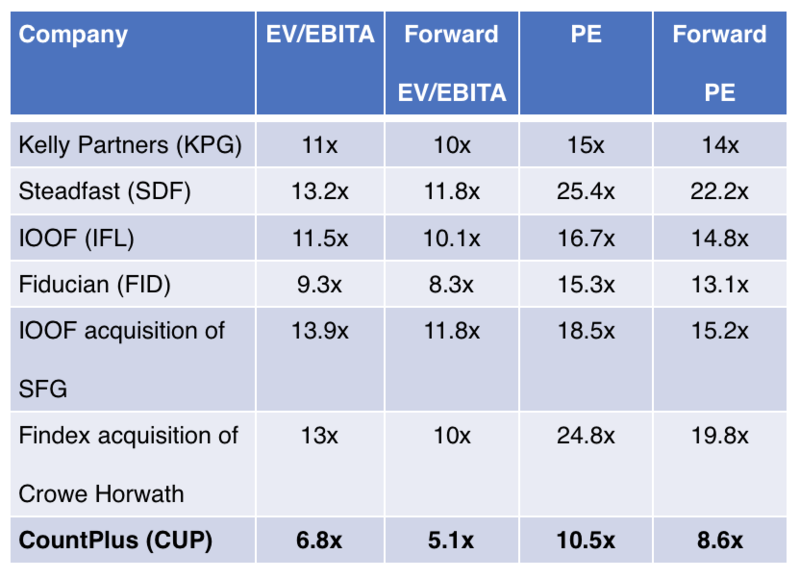 EV/EBITA is arguably a more appropriate metric with which to value CUP given the significant balance sheet capacity and the likelihood of the company becoming the target of an acquirer, as discussed earlier. There is usually a substantial amount of synergies for a larger acquirer to realise when acquiring a firm like CUP. As just one example, the opportunity to internalise firms under TFSA would factor into the equation despite the public equity markets yet to price that in. M&A of similar businesses occurred at multiples of 11-13x trailing EV/EBITA and ~10x forward. A good example is the acquisition of Crowe, which Findex bought when margins were well below average. SFG (Shadforths) was bought on a similar multiple despite margins being near best practice since the business was viewed as high quality. Based on the above it is my view that any bidder that wants a shot at acquiring CUP will likely need to offer a price that starts at $1.00-$1.05. And if the thesis outlined here is proven to be correct then I would not be at all surprised to see CUP receive a takeover offer later this year. And if a bidder isn’t flushed out? Then we get to see what Matthew and Co. can build with the new strategy. In 2-3 years time if the new model proves successful and the management team can execute on building a business with $20m+ of EBITA then I think there is a good chance the stock will be $1.50+, just assuming a market multiple. That of course requires successful execution on behalf of the management team. There are a lot of moving pieces to this puzzle. There is CUP’s ability to save $2-$4m in costs from 2020 which should arguably be priced into the stock well ahead of time. There is the upcoming sale of Count, the reliance of CBA on CUP and the need for CBA to retain CUP in order to maximise the value they can extract. That creates a powerful catalyst for realising the underlying value of CUP. Then there are the more usual factors in any turnaround story. The large discount to fair value. The likely resumption of dividends at the full year result. The capacity for margin improvement. The huge runway for growth by acquisition. And the multiple re-rating that occurs as the market recognises the progress being made by a company transitioning from turnaround to growth. That can often be the most powerful part of the thesis if you get it right. All of the above likely goes a long way to explaining the aggressive director buying. And it leads me to believe that CUP may be on the cusp of a re-rate. Disclosure: The author holds CUP shares. Good read thank you. Ultimately a people business and just like sgh.. Not an obviously scaleable business More compliance means more cost, more cost means higher pricing, higher pricing means more complaints.....NON virtuous circle? Hi Jim, SGH wouldn't be my first comparison! People businesses are good businesses *if* you get the incentives right. Acct and advice have big barriers to entry, high returns on capital, sticky clients, etc. And the new model where principals own equity in their individual firms, in my opinion at least, is highly scalable. Under this model the larger the CUP network grows the stronger it becomes. This looks like a turnaround at the inflection point of transitioning to growth, which can be a good time to take a look as you can get earnings growth & multiple expansion. But, lets see how it all plays out as management need to deliver now. Hi Mark, absolutely. Very possible and if it happens would be transformational for CUP. But it requires CBA to essentially rollover and exit at all costs without looking at other ways to maximise the value since selling to CUP would mean CUP are the only possible buyers and they’d get a fantastic price. Given the bad press around Count etc that may be possible, but I would have to assume CBA will look at ways to maximise what they get for Count/CUP stake in which case the other scenarios come into play. Then need to factor in the timing of when CBA want to offload Count (later this year) and if/when CUP are in a position to do it. The stock will need to be a lot higher for the numbers to work. But the hiring of a team like Genesis does suggest something big is in the works, eventually. Whether it is Count or something else. But agree with you, it’s possible.